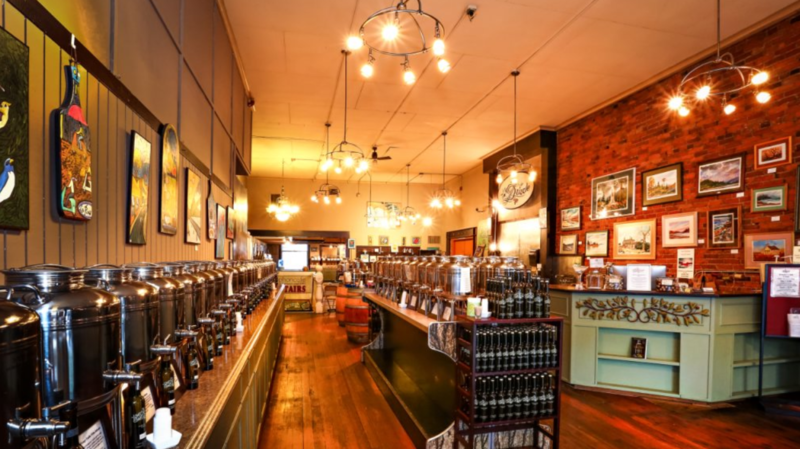 Home News An Update on Waples Mercantile Merchants: what’s opening next? Drizzle Lynden is opening this Monday at 10am! Similar to their Bellingham location in Fairhaven (pictured below), Drizzle Lynden is an Olive Oil and Vinegar Tasting Room, but will also be serving up tasty food: “Drizzle boards” with cured meats and cheeses, rustic-inspired plates created by chef Andy Nguyen, as well as fine beers and wine. Stay tuned tomorrow here and on ourLynden’s Facebook page for an exclusive preview of the Drizzle Lynden store before it opens to the public! Then, get your tastebuds ready for heaven this week to come in and sample lots of tasty flavors! Drizzle’s Fairhaven location in Bellingham – stay tuned on ourLynden for exclusive Drizzle Lynden preview photos tomorrow! Inn at Lynden: opening December 28th, reservations available now! The 35-room Inn at Lynden is opening in just two weeks, on December 28th. We’ve seen the rooms (stay tuned for a full preview! ), and they’re great. The bike-themed hotel will offer guests complimentary bicycles to ride around town, and a comfy stay in the fully-renovated historic building. 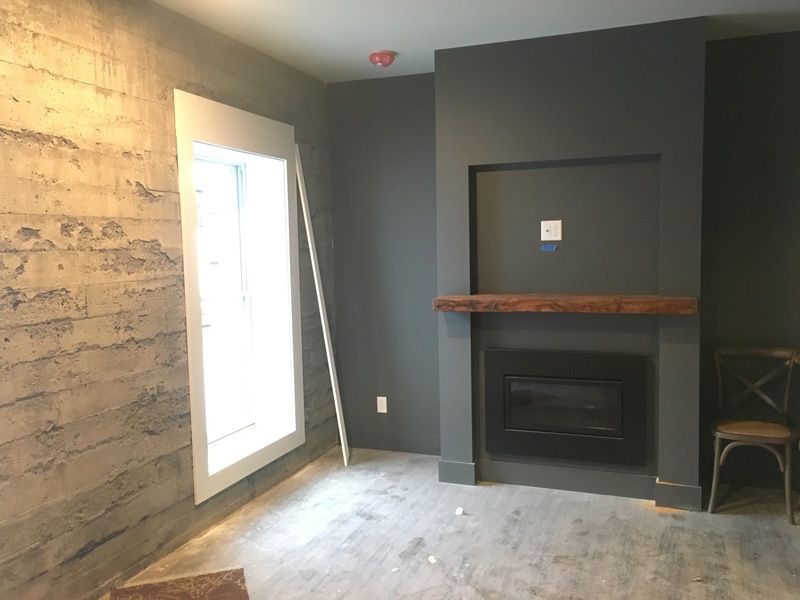 The sneak peak photos below show the fireplace in one of the rooms (which also has exclusive access to the building’s rooftop ‘Skywell’), as well as a neat exposed brick wall from the historical Lynden Department Store building. Historical exposed brick wall from the old Lynden Department Store building, in the Inn at Lynden hall between guest rooms. Reservations are available through their website now (www.innatlynden.com) — how cool would it be to stay there on opening night, even if you live just down the road? Overflow Taps: brews, ciders, wine, coffee and more coming early 2016! Overflow Taps is not your ordinary tap house. With community and charity as their focus, they’ll offer some of the finest local craft beers, as well as ciders, wine and cold-brew Woods Coffee on their 13 taps. With $0.25 from each pint sold going to help solve the global water crisis, every time a keg is emptied will be reason for celebration as it means one person has been provided with clean drinking water for the rest of their lives! 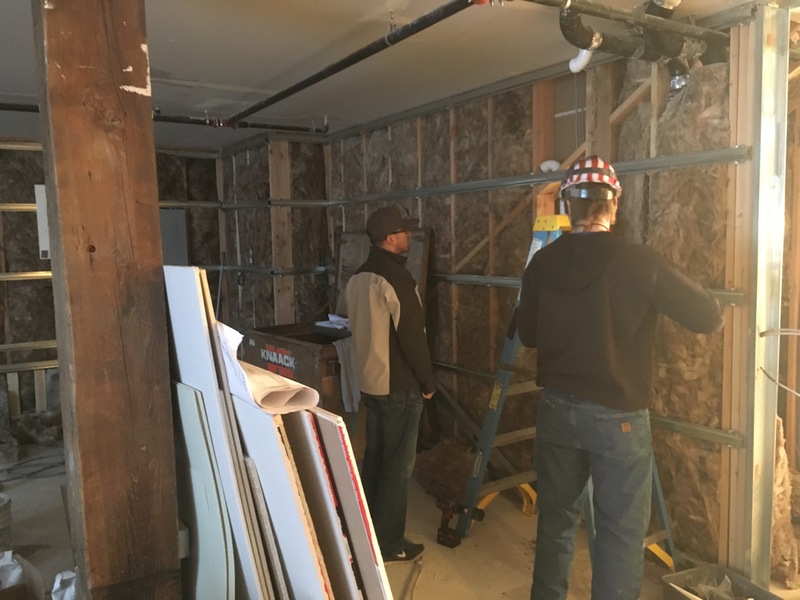 In the sneak peak photo below, Overflow Taps partner Jesse Nelson looks on as a contractor (also named Jesse) prepares plumbing through a wall to what will be the bar and tap area. Overflow Taps partner Jesse Nelson looks on as a contractor (also named Jesse) prepares plumbing through a wall to what will be the bar and tap area. Stay tuned here and on our Facebook page for a full early preview of the progress in the making of Overflow Taps! 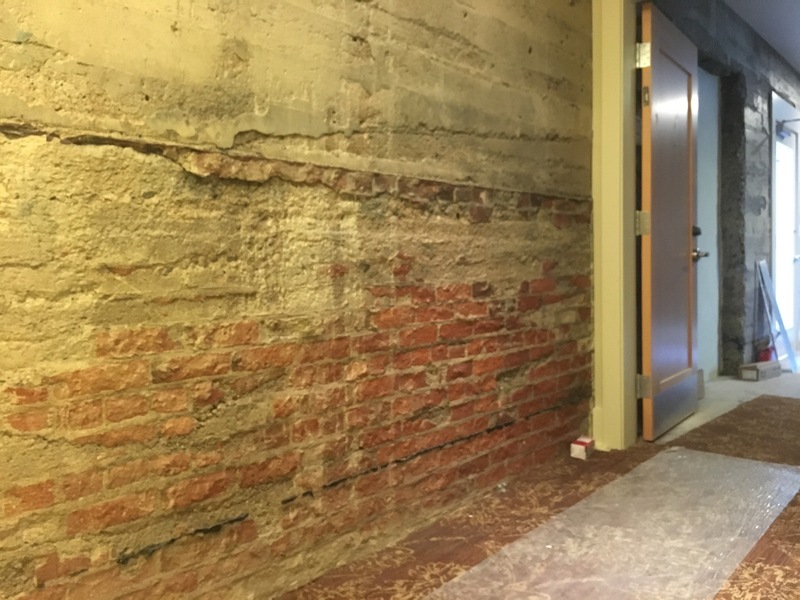 Like Overflow Taps, Avenue Bread’s spot in the building is one of the last ones to have basic construction done, then allowing them to move in and begin the build-out of their space. The building’s owners anticipate being able to give the keys to Avenue Bread around December 18th, after which time they can begin improving their space to be able to serve up the tasty food and drink that so many of us are looking forward to! 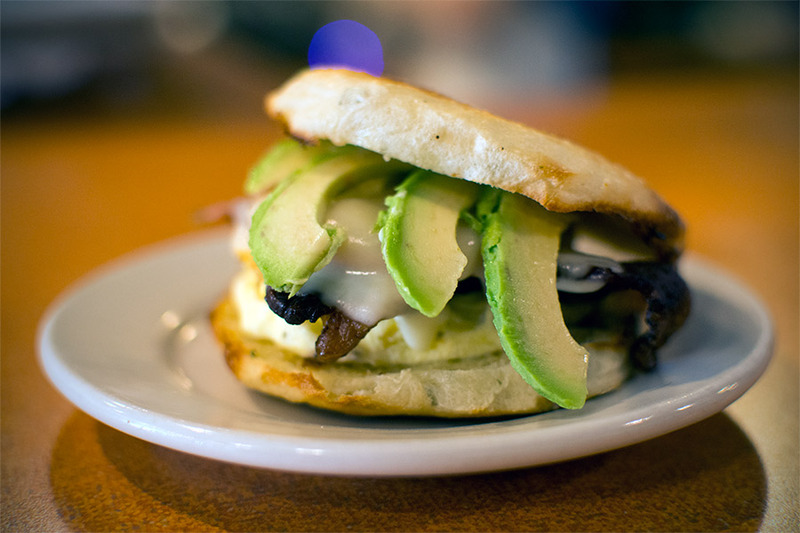 Have you tried an ‘Eggenue’ breakfast sandwich on their rosemary english muffin bread? If not, hurry to one of their Bellingham locations this weekend to get yourself pumped for next year in Lynden! Bellingham Baby Co. was born online in 2005, followed by their first retail location in 2008 in Bellingham. 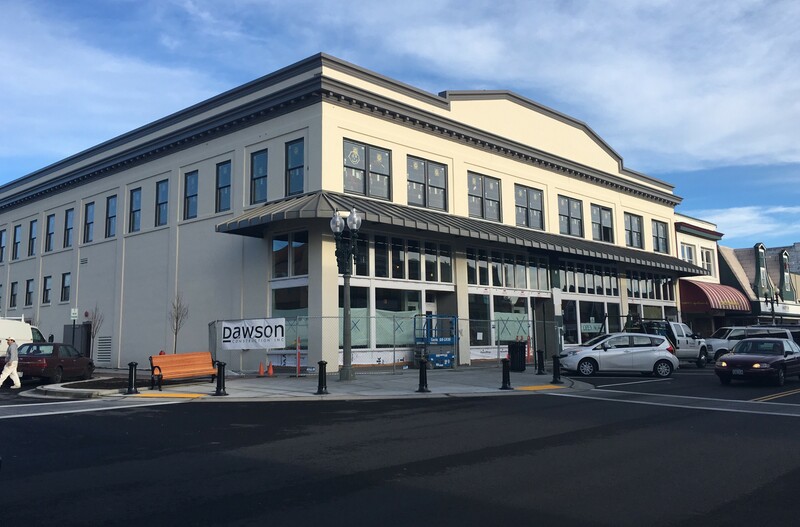 In the first part of 2016, their second location will open in Lynden (their sign visible through the back of Village Books says ‘Arriving in January’). 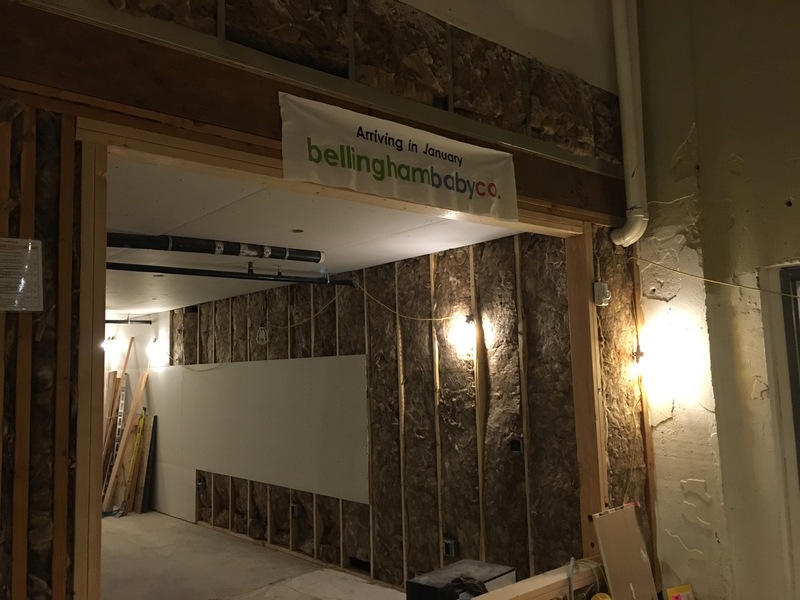 Bellingham Baby Co. “coming soon” sign visible through the back of Village Books in Lynden. While ourLynden is not just about new businesses, there has been so much happening on this front that it’s the talk around town lately. 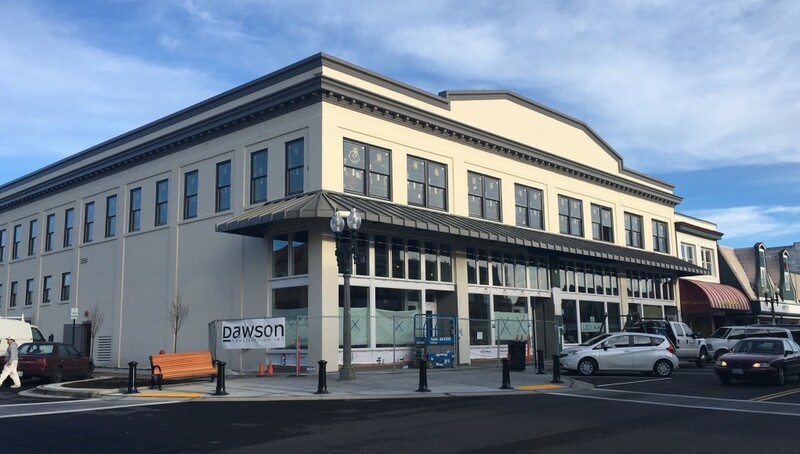 And since ourLynden is dedicated to connecting and sustaining the values of our community, the story of the Waples Mercantile Building is a great fit, as it ties deep into the roots of Lynden. 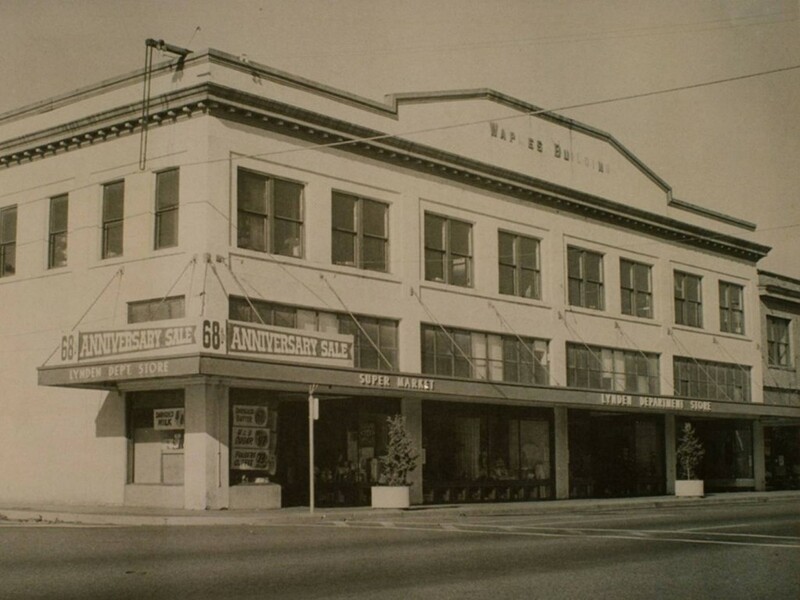 The building on the corner of 5th & Front Streets in Lynden has been a cornerstone in our community for more than 100 years, the majority of which it was home to the famous Lynden Department Store, founded by Billy Waples. In more recent decades it was home to Delft Square, a collection of businesses including retail, a restaurant and professional services. Then, in June 2008 the building was gutted with a huge fire, which left the building sitting empty for more than seven years until it’s recent renovation. 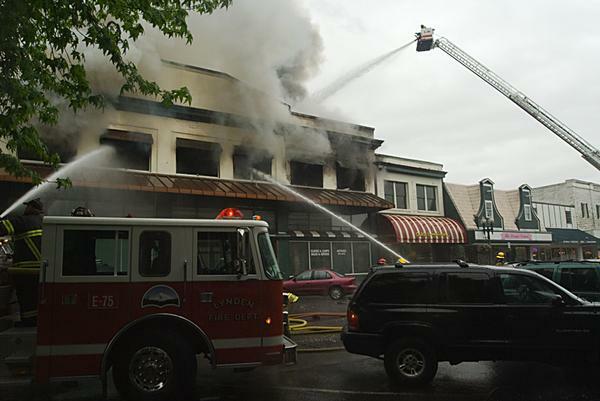 It was after a handful of failed proposals to improve the burnt-out building that Teri and Matt Treat joined with Debra and Jeff McClure of Bellingham to form ForeFront Ventures in 2013 and begin the arduous task of completely renovating the building while keeping many historic elements. 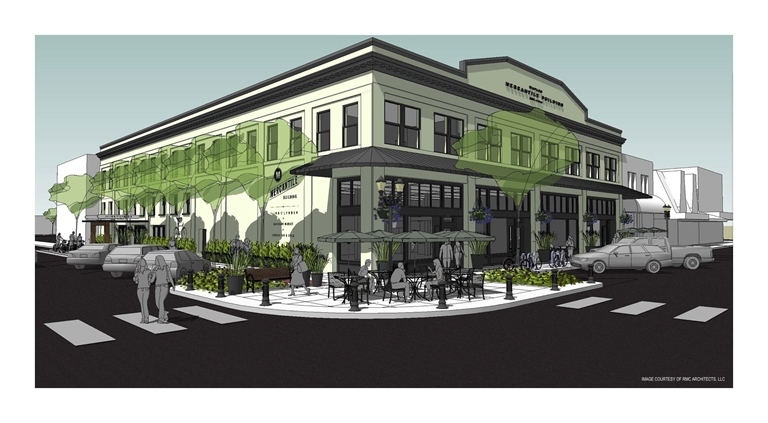 The Waples Mercantile Building is finally starting to look like the planned drawings! Our community will be ever-grateful to the Treats and McClures for their hard work and dedication and seeing this project through to completion.